Absenta Bar (in English, 'Absinthe Bar') is a restaurant and bar specialising in the service of the magical drink that is absinthe. The bar recreates the old Bohemian feel of Art Nouveau Paris, taking the experience of drinking to a new level, with customers enjoying the famous liquor at up to 90% proof. Not only through absinthe will visitors be transported - the bar also offers music and cuisine in keeping with its creative and Bohemian theme. 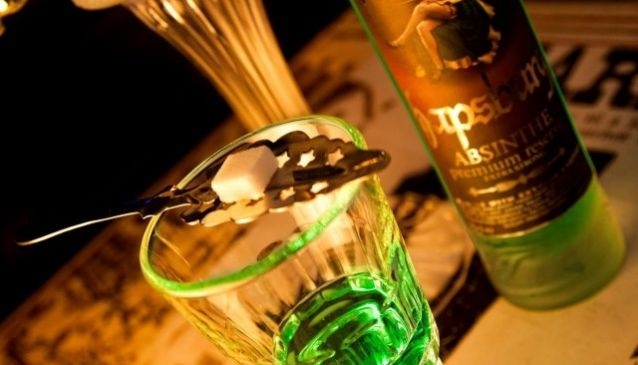 Also known as Green Fairy, for the drink was said to produce these kind of hallucinations, absinthe is often served with an elaborate ritual - one which Absenta Bar upholds. The shot is poured into a gothic glass and a metal spoon balanced on top. The spoon is of such design it allows a sugar cube placed upon it to slowly dissolve as the shot is drunk; the absinthe is then lit with a flame and water poured over the sugar and spoon. Although absinthe is obviously the spectacle at Absenta Bar, they also serve stunning cocktails and a wide range of dishes from their kitchen. A shot of the fiery spirit should complement your experience at the bar, not dominate it.